Internal power outlet for shaker, mixers, etc. * 115V with US Plug. For 230V (EU Plug), please add (-E). 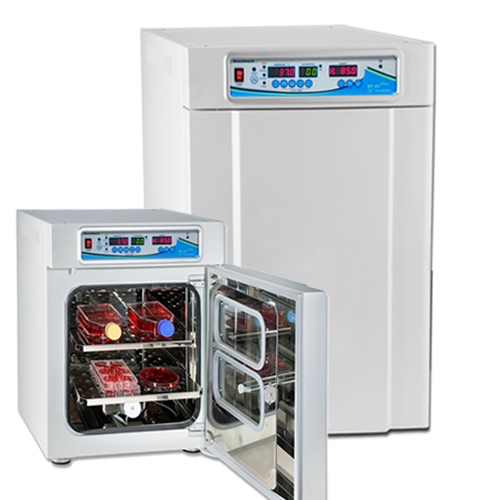 The myTemp 65HC Incubator is designed to provide accurate and uniform temperature control from 0 to 60°C. The broad temperature range of the instrument expands the use of this incubator to both heating and cooling applications. A large, digital display allows for visualization of the chamber temperature and the remaining incubation time, while an internal light is included for improved visualization of the chamber. In addition, a built in, internal outlet can be used to provide power to small instruments, such as shakers, rockers, etc. With forced air technology and stainless steel inner construction, uniform heat transfer is ensured throughout the internal chamber. When set for sub-ambient temperatures, the powerful compressor is activated, quickly cooling the chamber to the desired temperature..
With an exterior height of 39 inches (100cm), the incubator is designed to be floor-standing, yet is also compact enough for bench-use. (Not recommended for use on benchtops taller than 32″/81cm). The instrument is supplied with two, adjustable height shelves, while additional shelves can also be purchased separately (item: H2365-SH).